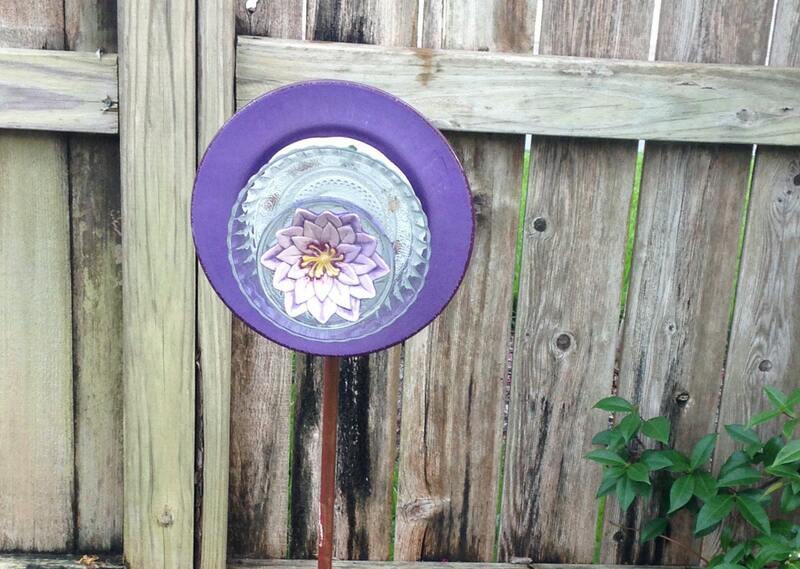 This beautiful purple glass flower is the perfect housewarming gift to grace a garden bed. The multiple layers of vintage and repurposed ceramic and glass pieces were hand selected for their ability to enhance the esthetic appeal of the flower. There are five layers to this flower. 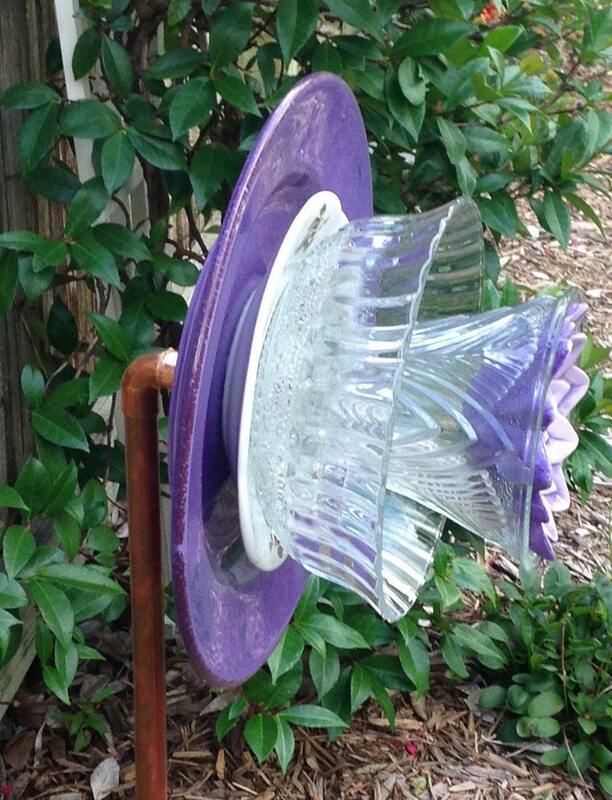 The base is a purple ceramic plate with imprinted texture on the rim. This base is topped with a slightly smaller vintage plate that is white with tiny multi colored fruit. I believe these are grapes, plums, etc.. The next piece is a clear glass round fluted and etched fruit bowl. Inside the bowl is a flared etched glass light globe. 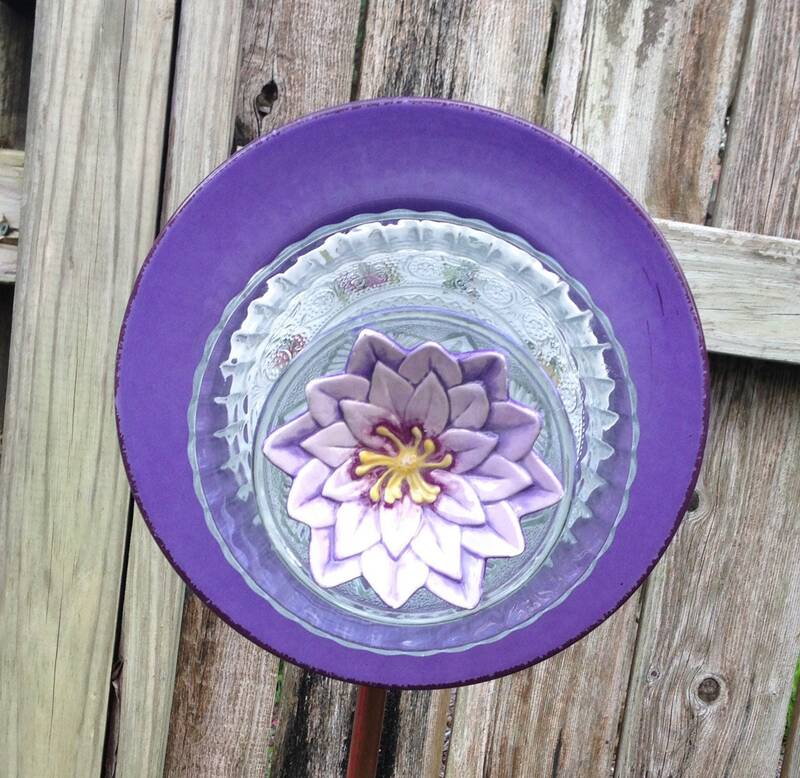 Lastly inside the globe is a ceramic piece that looks like a basket with one purple flower with a yellow center. Each individual piece adds to the beauty of the entire creation. 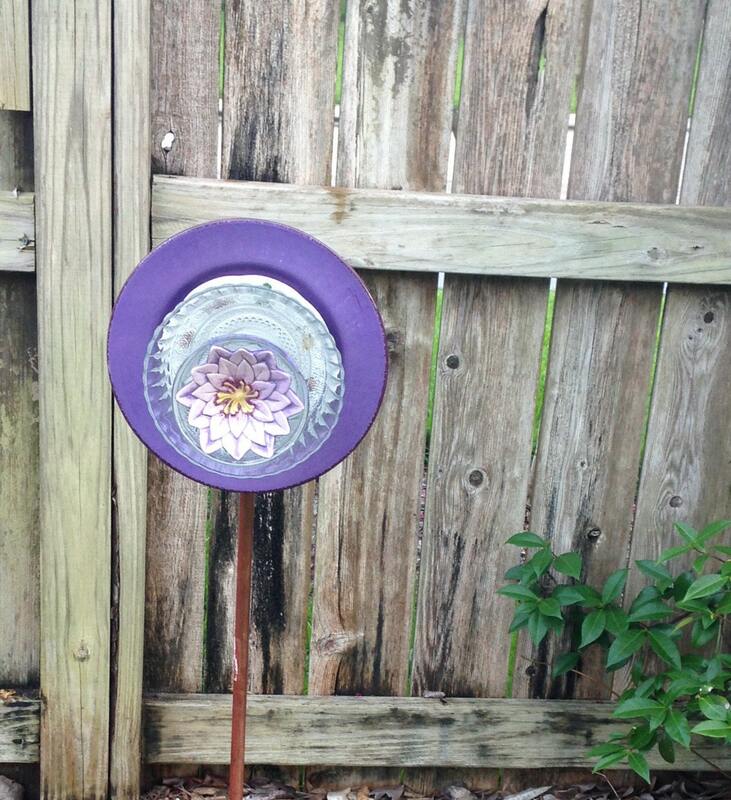 The flowers are planted in my garden using iron or cast aluminum and copper. I love the way that copper gets a handsome green patina and all of these pieces will lovingly get more beautiful over time. I collect glass and ceramic pieces where ever I travel. When I am out looking I think of each item not for the function it served in its former life, but for the color, clarity, and quality in its entirety and how it might lend itself to become a part of the garden. All pieces are then examined for their integrity and then arranged into my whimsical flowers. These are then assembled using the highest rated outdoor adhesive. After they are married in their proper position in the flower they are then put aside to cure for three days. 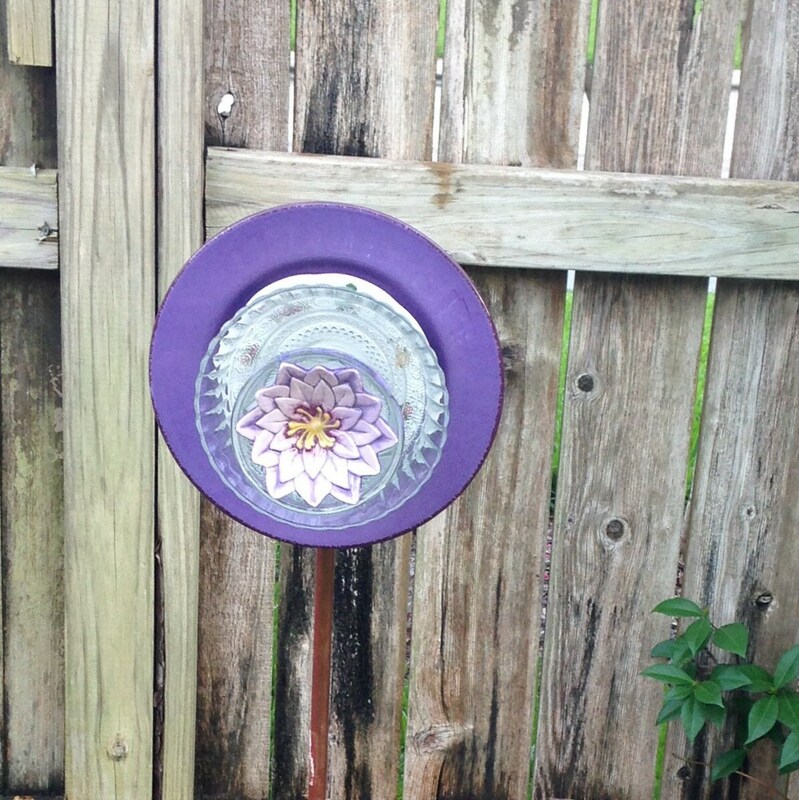 The back of the flower has either a heavy duty round iron flange or a lighter weight cast aluminum square affixed in the same manner and allowed to cure for an additional three days. This piece has a 1/2" female hex thread that is used with the included copper male adapter and 90 degree copper elbow. The copper elbow is then slipped slipped over a 1/2" copper pipe (not included). 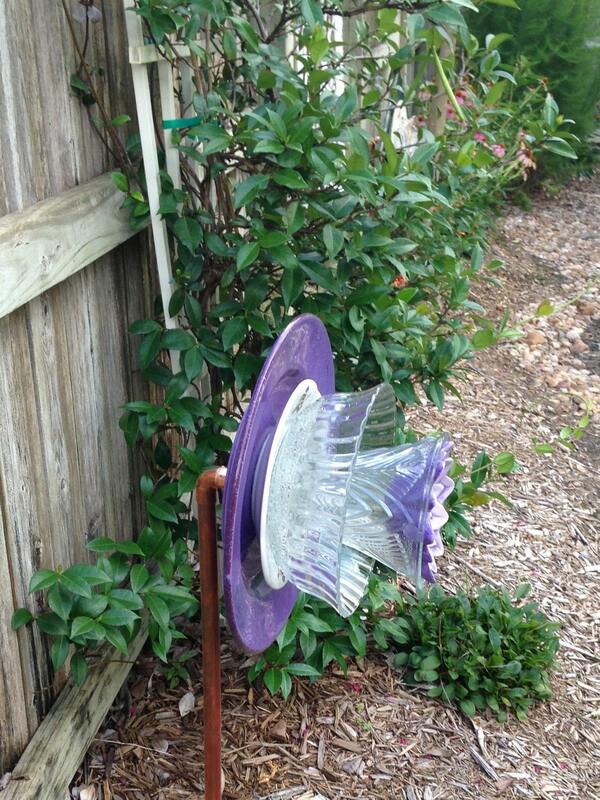 This copper pipe can be purchased at your local hardware store (Home Depot or Lowe's). 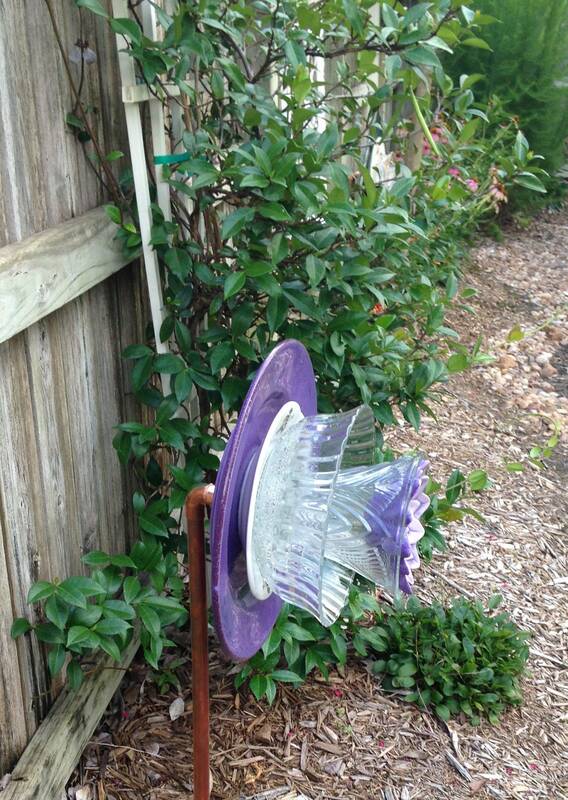 I like to use a 4' piece of pipe and sink it 10-12" into the ground, but you can grow your flowers shorter if you prefer. You may also display them on your dining room table or on a display stand, but do be aware that some of my flowers are heavy depending on the weight of the pieces used to create them.